For those who struggle with goal focused written therapy or need reinforcement as to its effectiveness, there is a great new book titled How to be a Writer who Writes by Greg Miller. Greg teaches creative writing to professional writers. His process is powerful and effective. He calls Phase 1 of his process open-ended, expectation free writing. This approach is designed to get you past your conscious editor, a crucial step in both creative writing and written therapy. In therapy, harnessing your subconscious allows you to replace bad habits, challenge twisted beliefs and influence destructive behavior. As a creative writer, this approach provides access to your experiences, stories, feelings, perceptions, ideas, concepts, skills and theories. You know a book is going to be great when it starts out “In the beginning, there usually isn’t a word. There’s usually a feeling. A flash insight. A moment of clarity. A revelation.” Capturing your emotionally laden thoughts and allowing yourself to be a beginner are important first steps in the creative process. Making thoughts visible starts the process of change. Writing can access deep-seated emotions and can get you to your creative center. Change is hard but doable. Knowing the process will get you to where you need to go. 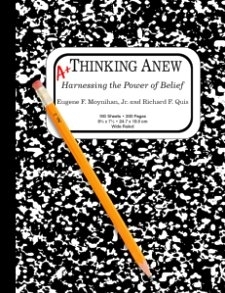 Thinking Anew is now available at Vroman’s Bookstore, both on-line and in the store. Vroman’s was founded in 1894 and is Southern California’s oldest & largest independent bookstore. Thinking Anew is a book within a composition book that helps people in crisis find the passion to make change stick. Writing is a powerful change agent when combined with an evidence based self-improvement methodology. If done daily, this approach will allow you to stay connected with your aspirations in a most profound way. It is the perfect place to keep notes and scribble your ideas. The author, Gene Moynihan, is a street-wise psychotherapist. He had the contract with the New York City Police Department for ten years helping cops deal with suicidal thoughts, substance abuse, post-traumatic stress, depression and marital discord. He has helped many people become what they are meant to be. Writing can be an antibiotic for distorted thinking. It clears the mind, provides access to your subconscious and soothes the soul. Caution, some assembly required, but the outcome will be awesome. For those of us who regularly lose focus, fail to finish or fail to start, Robert Genn, a master artist, a creative writer and a man of great wisdom, recommends the Pomodoro Technique. While Robert Genn’s audience is visual artists, his Pomodoro approach works equally as well when using writing as a means of self-improvement. “Lately I’ve become aware that some of my friends are losing their marbles. Their ability to concentrate has gone up the spout. They’re so overwhelmed with distractions and daily impedimenta that I hardly recognize them anymore. Too busy to paint, they are harnessed to a downward creative spiral. I was even losing a few marbles myself–so I deflected my problems by spying on their studio habits. Just as people learn to spell words and add numbers, folks can learn how to gain intention. It takes a bit of character and a Pomodoro. A Pomodoro is one of those red kitchen timers that looks like a tomato. Pomodoro is Italian for tomato. You can buy them on Amazon for $7.99. The Pomodoro Technique is a time-management method developed by Francesco Cirillo in the late 1980s. The timer is set for 25 minutes and then you focus and go to work on your predetermined job. At the end of the time period, the alarm goes off and you take a five minute break. Then you start on your next Pomodoro. If your Pomodoro gets interrupted by a phone call or a request to go down and drain the lake, you’ll have to stop and restart your Pomodoro later. When the concept of our thoughts influencing or attracting our life experience becomes part of our belief system, some amazing things begin to happened. As I began to share this with my patients, I strongly suggested they use the book to focus their thoughts on what they wanted to achieve. The daily writing of their intentions began to produce definite results in their connecting the writing to their daily life experiences. Their experiences paralleled mine, almost exactly. It became obvious that anyone who was willing to submit to a daily discipline of recording their intentions for the coming day, could experience the amazing fact of one’s thoughts manifesting into the life experience of their day. The concept of our thoughts becoming the things that we are living started becoming one of the facts of life. I’m not sure exactly when it happened, but not too long after I began my private practice, I began to notice, and become frustrated by how difficult it appeared to be for my clients to learn from their experiences in therapy. We would deal with the presenting issues, formulate a game plan, and eventually solve the problem. Six months later, they would call for some help with different circumstances, but basically the same problem. I began to realize, that I was failing to give them something they could use to solve whatever problem presented. The real problem lay in their thinking. We are all creatures of habit, and thought patterns become habitual. Negative beliefs influence all patterns of thought, and I realized they seemed to be attracting the same types of problems over and over again. If they could find some way of channeling their thought patterns in a more positive direction, perhaps their life experience, as a whole, would improve. 9/11 memories, and how Thinking Anew helped. Each year, the 9/11 memorial date eases a little in intensity, and feels as though it’s almost emotionally manageable. This year followed suite, and as the e-mails and text messages from the volunteer police officers and therapists of CISM (Critical Incident Stress Management) teams from over 60 different police departments flowed through my laptop, I remembered the conflicting emotions I experienced as I met and worked with so many selfless people who gave of themselves to help the first responders so damaged by the trauma of the World Trade Center. Their kindness and caring stood in sharp contrast with the grief and sadness caused by the friends and co-workers that I had lost in the towers. Each day this week, I wrote in the black book my intentions for the day. My entries were written expressions of my need for guidance and direction through the emotional mine field of my memories of 9/11. As it has for over the last fourteen years, my Thinking Anew discipline provided inspiration, direction and resolution. It manifested in the form of e-mails and text conversations, through which I exchanged loving communications with former strangers who have somehow become intimate, essential members of my support system, via an annual reminiscent connection. As always, I received what I asked for, and got what I needed. Keep writing. It works.